Published on July 29, 2017,	by admin in Alaska Trip. 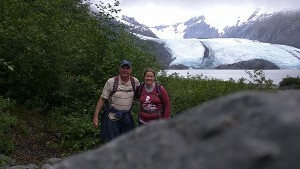 Kleenex and Castaway at Portage Glacier. On Friday, Kleenex and I traveled an hour south of Anchorage to hike a trail to Portage Glacier and visit the town of Whittier. 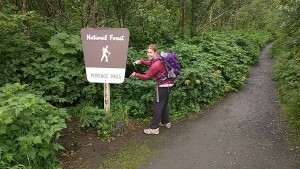 The weather was cloudy and misting for much of the day, but the skies cleared and the rain held for most of our hike. It was a fun day. Because it was a day trip, and we knew we would have to pay to got through Whittier Tunnel, Kleenex drove us in her car. Our first stop was at the Boggs Visitors Center where they had some information about points of interest in and around Portage Valley. 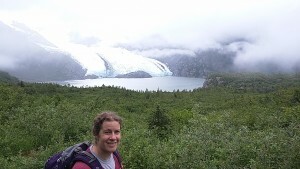 We also went to check out the price of a tour boat that took you up to the face of the glacier. If it was better weather we may have taken the boat ride but voted to just enjoy a hike this day. 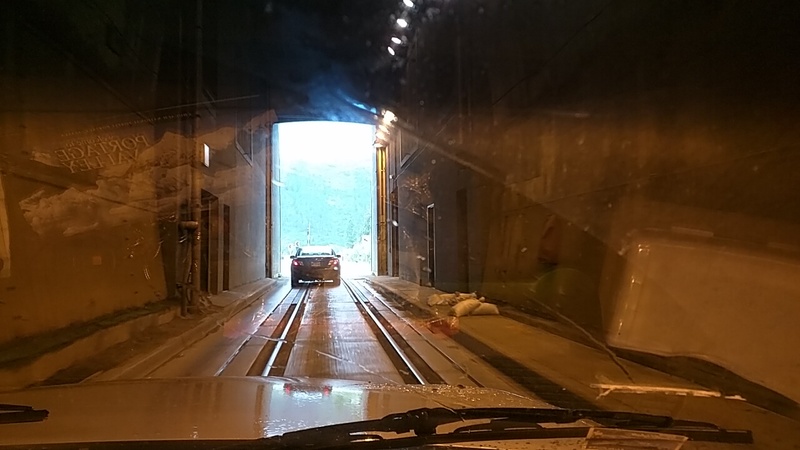 We proceeded on through the two-mile tunnel and drove on into Whittier. The tunnel is a marvel in itself. 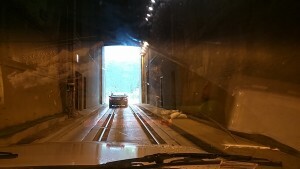 Blasted through solid rock and completed in two years, the one-lane tunnel was originally made in 1941 for train travel to connect the port with interior points. Sometimes the wait for your turn can be a half hour or more. We were lucky to hit the line as cars were being let through just as we arrived. Kleenex told me that weather in Whittier is almost always rainy. Because the coastal mountains trap the moisture from the bay, it can be sunshine in Anchorage and raining in Whittier. We saw a sign for a museum and decided to browse there for a bit and wait for the weather to improve. The museum had many displays of pictures about early ocean explorers, building the tunnel, and the war of the Aluetian Islands. We read articles for about an hour then had lunch before driving to the trail. 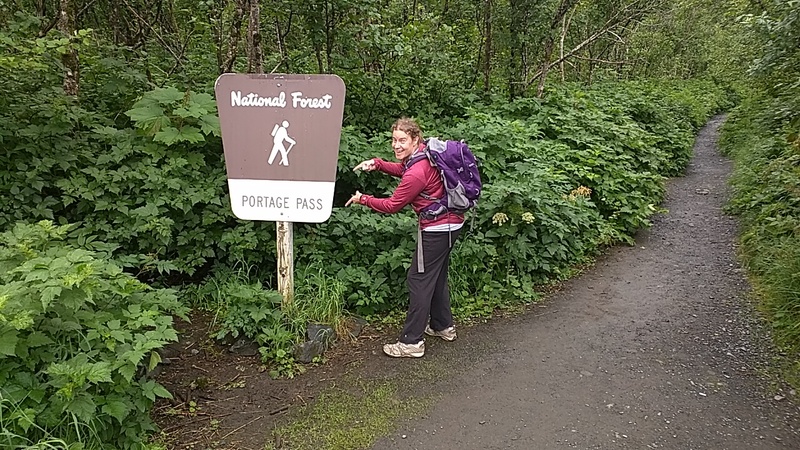 The trail to Portage Glacier was only 2 miles up and 2 back but there was a steep hill to climb up to the pass and then a knee punishing decent down to the lake. When I start climbing hills I realize how out of shape I am. As we neared the lake where Portage Glacier entered the water, the clouds lifted and we had great views of the glacier and icebergs in the lake. On the hike back from the glacier it rained some but we didn’t care; I was so hot and sweaty that the light rain felt good. We had to wait 30 minutes to get back through the tunnel. On the drive home Kleenex took me to see the hippy town of Girdwood. There were lots of artsy places, a luxurious resort hotel, and a classic ski slope. We stopped for ice cream and arrived back in town about 6:30 pm. I had a wonderful time with a great friend. We even made a date to go see a movie later that evening. By the time the movie let out I was ready to crash. On Saturday I will help Kleenex move some of her belongings to a room where she will be staying and then go with her to a pot luck meal with people from her church. I bet it seemed like old times to be back out on the trail with Kleenex. I’ve been to Portage Glacier a few times, and also to Whittier (I took the train to Whittier and then hopped aboard a day-cruise on Prince William Sound on my 1998 trip with Robin.) I’d sure take some of those chilly, rainy days right now. Northwestern Montana is having a heat wave. Not quite as bad as Phoenix, but not like I was expecting up here!